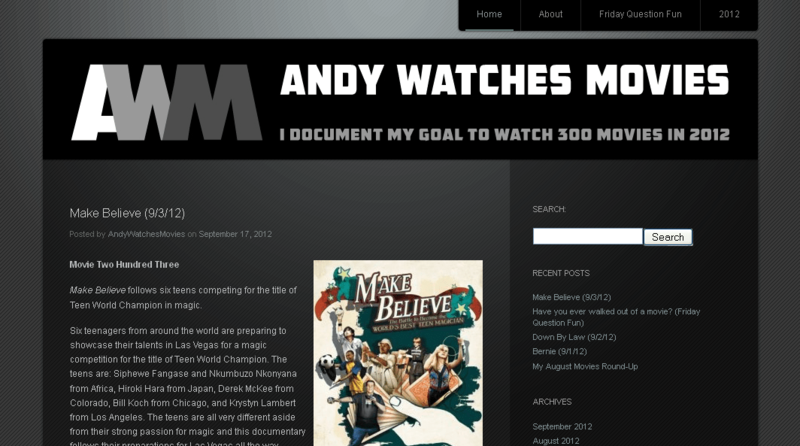 Movie reviews for every single movie I watch in 2012 on my way to my goal of watching over 300 movies this year. My goals are mainly to discuss movies and offer my views on them. In just over 3 months I’ve passed 10,000 views which is something I never even dreamed of. I would love to keep going and see where this takes me. I prefer people get involved in the comments section. Discussing movies is second only to watching them. How long has this site been active for, and how frequently do you post updates to your site? Started the site in early March of 2012, I post at least 3 times a week, usually more often. I follow other film blogs on WordPress and saw the links to LAMB. I also follow the site (and many members) on Twitter.